CopyTrans Manager enables you to drag and drop MP3s directly onto your iPhone or iPod. iPods, iPhones and iPads are all hugely desireable ways of carrying big chunks of your music collection around with you, ready for it to be played at just the right moment. However, getting tracks onto your device can be a bit of a frustrating process, involving importing them into iTunes, getting them converted and then synchronising the contents to your device. It all seems like a lot of fuss and you can be excused for thinking that there must be a better way. In fact there is, in the shape of CopyTrans Manager, which is a free component from the larger CopyTrans Suite. You have to download the suite and install it before you can get access to its components. Once the program is launched, choose CopyTrans Manager and the utility will be downloaded and installed for you. If you select any of the other tools, you’ll need to register and pay for their use, but CopyTrans Manager is free. Once launched, you’ll see a message telling you that it’s safe to connect an iPod or iPhone. Plug in your device and wait for it to be detected. The program will display the current music contents of your device. 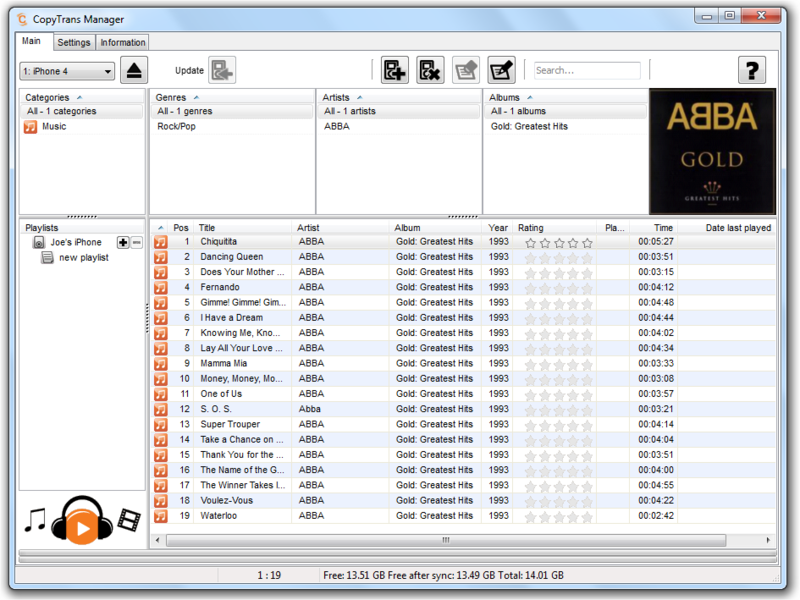 To add a new track, browse to an MP3 file on your PC and click and drag it onto the CopyTrans Manager window. It will be added to the list of tracks on the device. Repeat for any other tracks you want to add and then click Update. After a brief sync the tracks will be transferred and you can unplug your device. All without iTunes. Importing and synchronising music files with iTunes can be a very frustrating experience. CopyTrans Manager makes the process much simpler and far more intuitive.